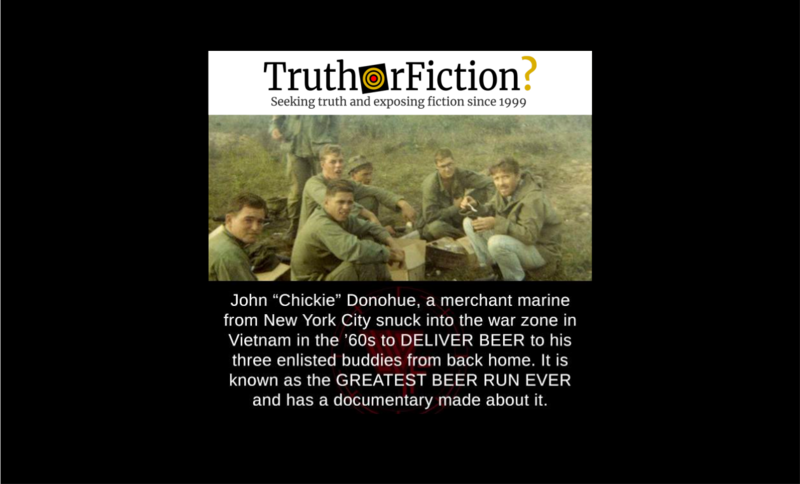 Did John 'Chickie' Donohue Pull off a War Zone 'Beer Run' in Vietnam? - Truth or Fiction? A meme about Donohue’s long-circulating claims condensed a lengthy account into a few not-entirely-accurate sentences. 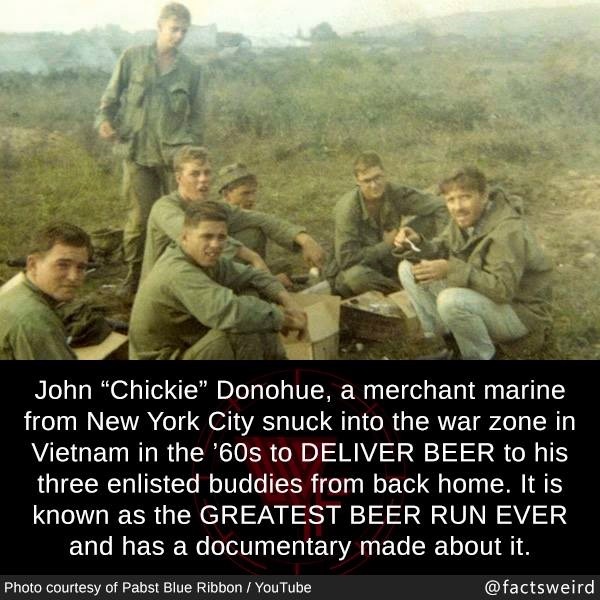 Merchant Marine John "Chickie" Donohue arranged a "beer run" to six friends in an active war zone in Vietnam in the 1960s. At a time when the Vietnam War was at its height, one man, John “Chickie” Donohue, snuck back into the war zone to find his 3 closest friends and buy them a beer. Produced by Makuhari Media and Pabst Blue Ribbon. For decades, Chick Donohue’s “greatest beer run” story has been met with incredulous scoffs. “For half a century, I’ve been told I was full of it, to the point where I stopped even telling this story,” said Mr. Donohue, 75, who has related countless times how he took a patriotic bartender’s suggestion and made a daring, adventurous visit to Vietnam in 1967 as a civilian to deliver beer to his soldier buddies … Tired of the scoffing, he has now written a book about it — “The Greatest Beer Run Ever: A True Story of Friendship Stronger Than War” — with Joanna Molloy, a former reporter for The New York Daily News. Mr. Donohue, who had served four years in the Marine Corps and was working as a merchant seaman, took [anti-war sentiment] to heart and got a job as an oiler on the Drake Victory, a merchant ship taking ammunition from New York to Vietnam. He shipped out with a duffel bag full of beer and what information he could gather on a half-dozen friends stationed in Vietnam. … “It took two months to get there, so I drank all the beer,” [Donohue] told the sandhogs, adding that he replenished his supply in Vietnam. He arrived in Qui Nhon harbor, where his friend Tom Collins was stationed with the 127th Military Police Company. Drunk ideas, while entertaining, rarely end well. But there are exceptions. Like that time in New York in the late 1960s when a conversation about anti-war protesters led one veteran to set off on the greatest beer run in history … What followed was an 8,000 mile, four-month odyssey. Donohue trekked across a war-torn country, talked his way onto transport trucks and military aircraft, all so he could meet up with local guys from his neighborhood and bring them a cold — okay, lukewarm — brew. “A lot of my friends were serving in Vietnam, and I just wanted to go over there and buy them a beer,” he candidly explained in a 2015 video short, in which Donohue met up with three of the servicemen he’d provided with beer in Vietnam: Bobby Pappas, Tom Collins, and Ricky Duggan. … Donohue talked his way onto convoys, military mail planes, and transport helicopters. He even got caught in the Tet Offensive and was briefly stranded when his ship left port without him. So he hung around, caught up with his buddies on the front lines for a bit longer, and by March 1968, made his way back to Inwood where his beer run quickly became a local legend. John “Chickie” Donohue’s long-circulated claims about visiting enlisted buddies during the Vietnam war were substantiated by his friends (along with travel documents shown in the Pabst video above). However, the meme condensed the story into a version that didn’t align entirely with Donohue’s original tale. Donohue and his friends claimed that he indeed visited several war zones and areas of active combat on his lengthy trip, but said it went on for months and was not a singular incident.